On August 15, a team including Moe, Philip, Kelsey, Marianna and Kari left Campobello Island for an offshore trip aboard the Shelagh, captained by Joe. Destined for Roseway Basin and slated to last two weeks, the Shelagh was packed to the brim with food, supplies and equipment. After a few days of loading and orienting ourselves to the boat, we left around noon on Friday and began surveying after leaving the harbor. Our sightings in the Grand Manan Channel were few and far between, but there was plenty of fishing gear to be counted. After we ate our first dinner at sea, we continued transiting overnight so that we would reach Roseway Basin by the morning. Heading to the Shelagh, at Campobello Island. The next day, we were able to start our tracklines at the western edge of Roseway Basin, and we surveyed our southern-most track from west to east. There were far more pelagic birds seen than the day before, such as greater shearwaters, gannets, and Wilson's storm petrels. The amount of bird life seemed promising, but the majority of our cetacean sightings were fin whales. We were hove to for the night, and in the morning began surveying more to the northeast. Again, we had very few sightings of anything, and the weather was making our trip more than just a bit unpleasant. 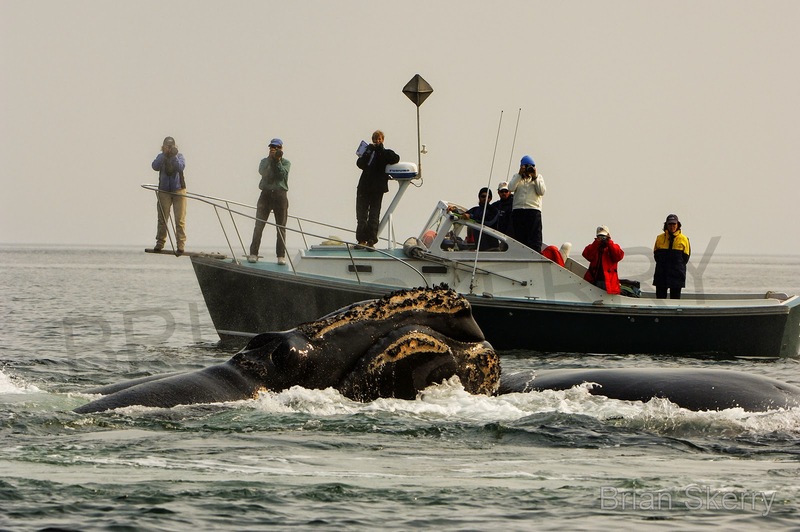 While Kelsey and Philip were on watch in a sea state 4-5, two breaching humpbacks were sighted. Success! Breaching humpback, photographed by Philip Hamilton. This being the most action we had all day, we were determined to get photographs to identify the individuals. Doing our best to hold on to the coffee pot in the galley while Kelsey and Philip did their best to hang on up top, the team worked together to collect photographs in the safest, most efficient way possible. After confirming that the weather would be worsening the next day, we headed in that night to the port at Daniel's Head on Cape Sable Island, N.S. 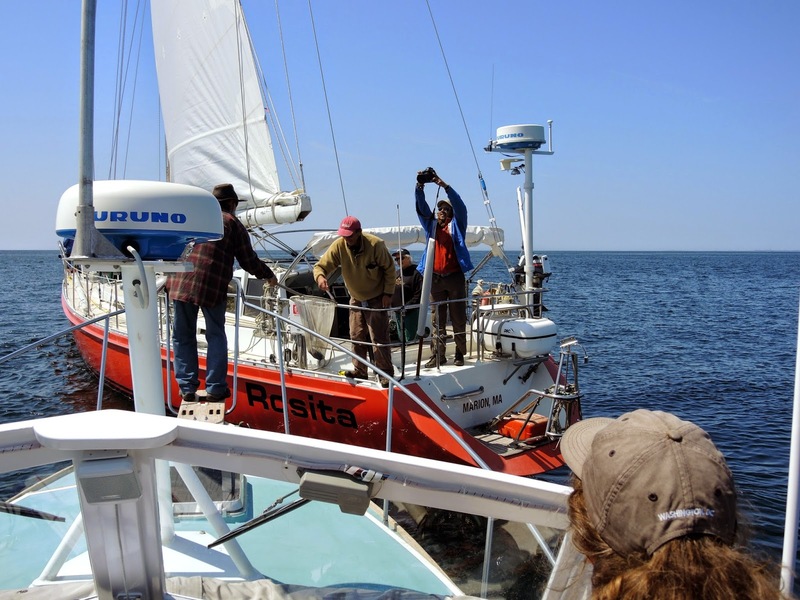 After docking in Cape Sable, the team was eager to go for a walk and do some stretching. A boat sure can get dirty in three days! We spent the morning in port cleaning, and then welcomed a guest from JASCO Applied Sciences who came bearing some important equipment- the pop-up acoustic buoys that Dalhousie University requested us to deploy. We were happy to oblige, since the buoys will detect right whale calls in Roseway Basin- check back for a future post in which Moe will explain the details! Getting cozy with the fishing boats at Daniel's Head, Cape Sable. 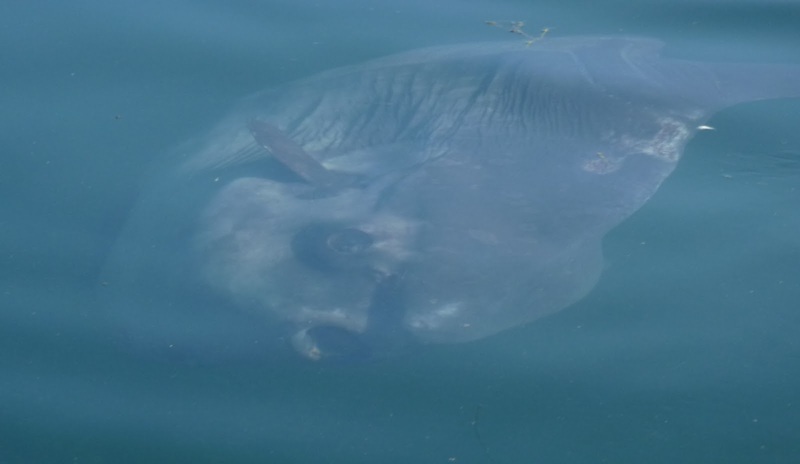 Since its my first time in Lubec for the Bay of Fundy field season, I was pretty excited for what sightings were in store for me! Although I’ve already had experience with right whales, mainly flying aerial surveys, I was excited to see the whales from a different perspective. I was also interested to see the different kinds of birds that lived in the waters of the Bay of Fundy. 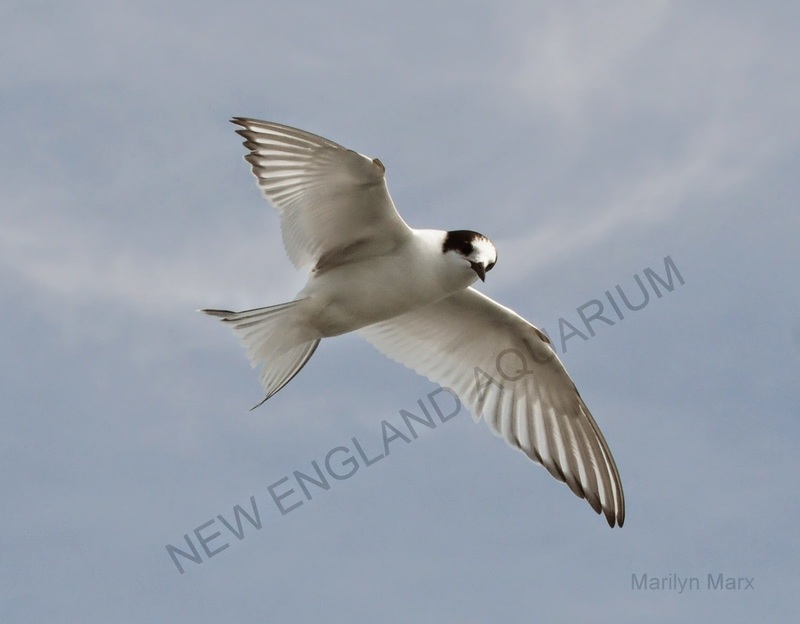 Many of the birds we see on our surveys are familiar to us from the waters near Boston. We saw Great shearwaters, as well as a few Sooty shearwaters, a group of birds that get their name from their characteristic shearing flight just above the surface of the water. Great shearwater gliding above the surface in the early morning calm. Shearwaters are found in the western North Atlantic for a few months in the summertime, and feed mainly on small fish--so they are often found near large whales, like the humpbacks we’ve seen on recent surveys. This Great shearwater must have thought we had fish on board when it joined us for lunch! We’ve also seen large groups of much smaller birds, storm petrels! These delicate birds are actually related to the larger shearwaters; they are in the same order Procellariformes, commonly called tubenoses. The tubenoses get their name from their pronounced nostrils enclosed in tubes at the top of their bill. The birds can drink seawater, and they extract the salt using a special gland, excreting it through the tube. Storm-petrel on a search for plankton. 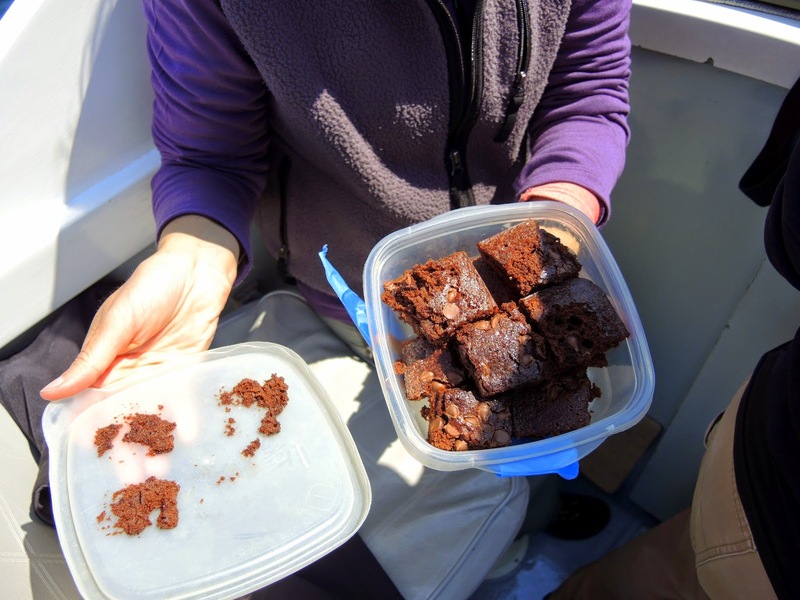 Storm-petrels (and other tubenoses) also have a sense of smell, rare among birds, that allows them to find and exploit patchy food resources. They mainly feed on plankton, and Wilson’s storm-petrels in particular can often be seen “dancing” on the water, picking out bits of plankton from the water’s surface. Since they feed on the same type of food as the right whales, we’re hoping that the fact that we’ve seen such large numbers of them means that there is plenty of food for the whales, too! Wilson’s storm-petrel “dancing” on the water. Another small bird we’ve been seeing a lot of are Red and Red-necked phalaropes. Since we are usually fairly far from shore, you might be surprised to find out that these birds are actually a type of sandpiper, birds that are more commonly found along shorelines! However, these birds migrate through open ocean from their breeding grounds. We’ve noticed a lot of large groups of phalaropes sitting on the water, where they pick insect larvae from the water. Red phalarope taking off as the Neried passes by. A real treat for many of us that spend most of our time in the Boston area are the alcids we see in the Bay of Fundy. The most recognizable bird from this family is the Atlantic puffin, which we’ve gotten great opportunities to observe so far. We’ve also sighted many Black guillemots, and some Razorbills--both puffin relatives. If you were lucky enough to see these birds further south, they would probably be in their basic (non-breeding) plumage, so it has been a real treat for me to see them all in their summer finest! Juvenile Razorbill swims behind an adult in breeding plumage. 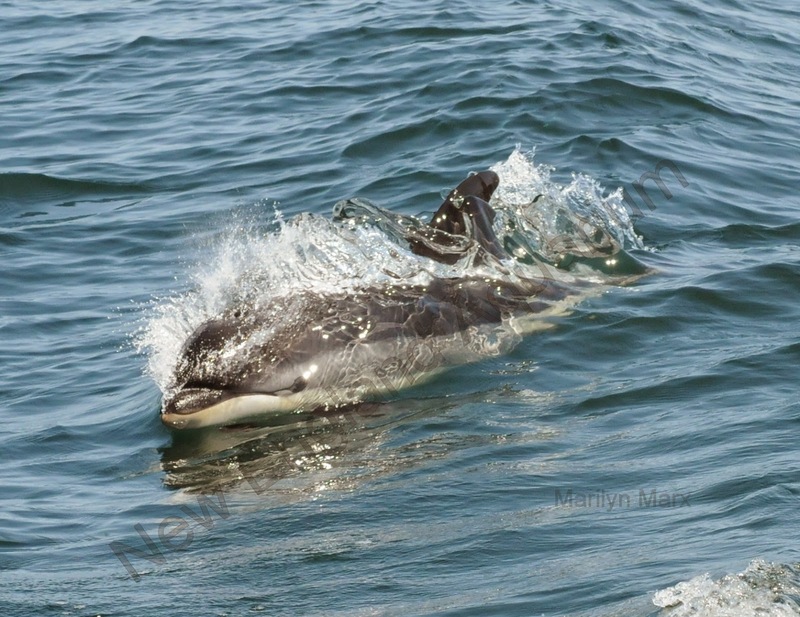 Overall, it seems like theres no shortage of life in the Bay, so hopefully its an omen of whales to come! Sunday was a stunningly beautiful day out in the Bay of Fundy--a glass calm sea state and excellent visibility. With the three vessels mentioned in our last blog: Nereid, Callisto and Selkie we did an extensive survey. We could see for miles and found humpbacks, fin whales, molas, dolphins and basking sharks, but no right whales were sighted. We were disappointed of course, but are hopeful that the Bay will soon be back to the way it was in 2006 when photographer Brian Skerry got this wonderful photo of the Nereid working a surface active group for a National Geographic article about right whales. While some of the team is offshore, a few of us have stayed in Lubec to continue surveying the Bay of Fundy. We had two good days out on Wednesday and Thursday but the number of whales had dropped significantly since last week’s surveys. Even with thorough coverage (by 3 research vessels: Nereid, Callisto and Selkie) in calm seas only seven whales were photo’d in the two days. That's quite a change from the 26 individuals seen on August 12. ...and a very beautiful avian visitor--curious tern! 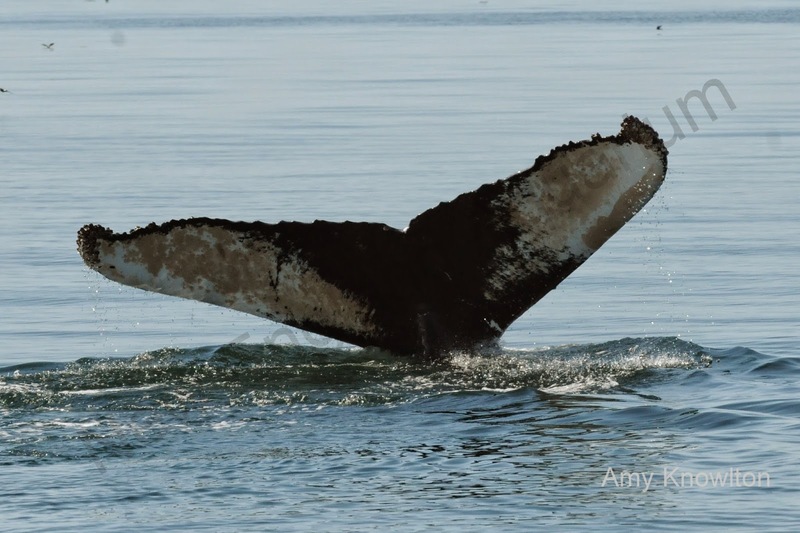 Meanwhile out on Roseway, the Shelagh crew have been having some very successful days and have seen many of the whales that had been in the Bay of Fundy during the first week of surveys back in early August. We are hopeful that the whales come back into the Bay, so stay tuned! 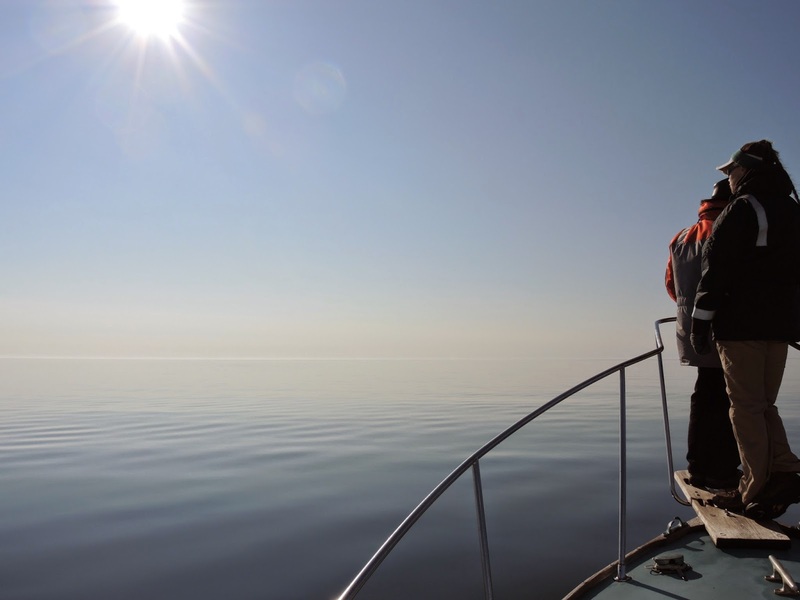 Similar to last year, a team of five researchers and Captain Joe have headed offshore on the Shelagh to survey Roseway Basin for right whales. 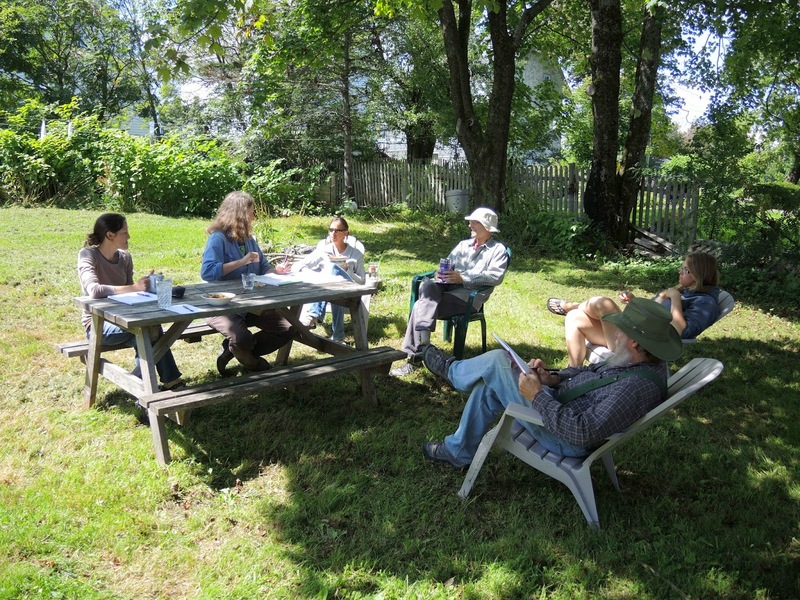 This year, however, the team will be away from the Lubec field station for two weeks! 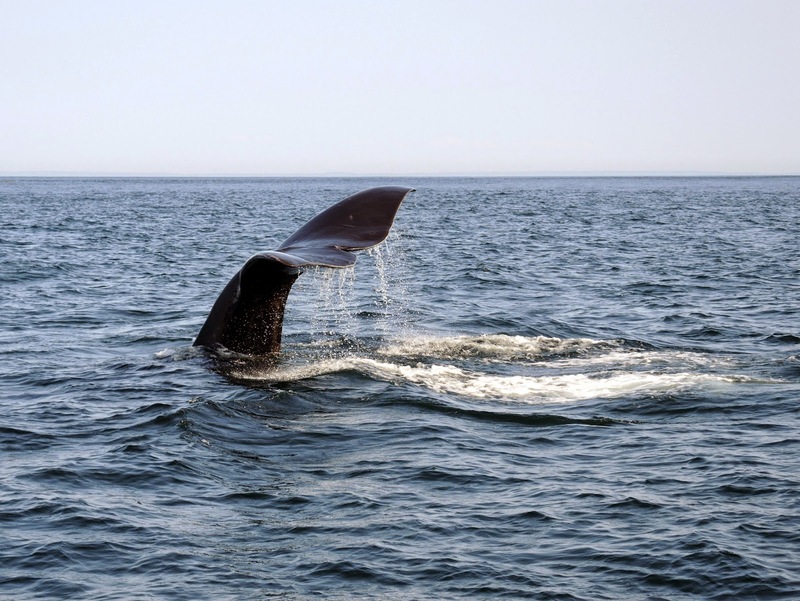 They are hoping to find lots of right whales, and will also be helping Dalhousie University to deploy several acoustic devices that will record underwater noises (hopefully lots of right whale calls!) continuously for days. The Shelagh will be docking at Cape Sable Island, Nova Scotia, to refuel and take refuge during inclement weather. 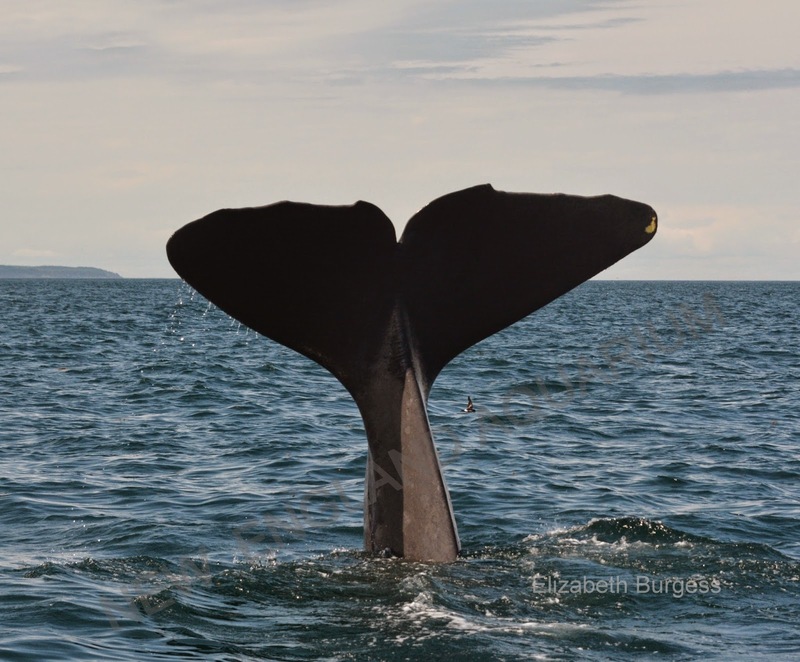 Hopefully the team will return to Lubec with lots of documented right whale sightings, and plenty of fun stories from being at sea! The team checking out the Shelagh before loading supplies and equipment. As we traveled to the east, an odd looking whale was sighted on the horizon. Was that one whale, or two? Did that blow look different? Amy was able to identify the species from a distance: sperm whale! We've had a few sperm whale sightings every year since 2010. The hydrophone was lowered over the side of the Nereid, and we took a few minutes to enjoy listening to it click click clicking. Take a listen for yourself! Back in the office that night, Monica would identify our sperm whale as a whale that we have photographed in the Bay of Fundy before! We bet the researchers we've been sending these sightings to will be pleased to have another data point and evidence of residency. We continued on our tracklines, heading further east than we've been so far this year. Although we had an idea of where most of the right whales would be, we avoided that area on purpose because we wanted to survey the shipping lanes. If there were right whales there, we could immediately alert the shipping traffic to their presence. Fortunately, we didn't observe any whales in the shipping lanes- let's hope that our slow moving friends continue to reside elsewhere! Once we completed our eastern survey, we moved west and eventually came across the right whales we were expecting to find. They were very scattered but would log at the surface for a few minutes before diving, so we were able to photograph many of them. In all, we documented 24 individuals! After two full survey days, it was nice to have Saturday to catch up on office work and have a team meeting. Everyone went to bed pretty early because the weather for the next few days was looking great, and we needed to be well-rested and ready for it. A small team, meeting in Saturday's sunshine. So, on Sunday we pushed off the dock at 6:45 AM and ventured out into the Bay of Fundy. We've been noticing how few harbor porpoise we've been seeing- nothing to be be alarmed about, but usually our journey across the Grand Manan Channel yields a significant number of these little guys. After a few quiet survey hours, we started seeing right whale blows around 10 AM. Monica was our whale watcher for the day, working to identify individuals and communicate to the photographers and person at the helm. Some of the whales had not been seen on our prior surveys, and most of the whales were behaving pretty chill- not associating with each other, and briefly logging at the surface before going on 10 minute dives. However, the whales were scattered and it was not too easy to follow individuals. At one point in the day, Dropcloth (Catalog #1271) was seen. Dropcloth is a male who was first seen in 1978, but we don't know how old he is. He still needs to be biopsy darted for genetics, and although we tried to obtain a sample, we were not able to. Hopefully next time! 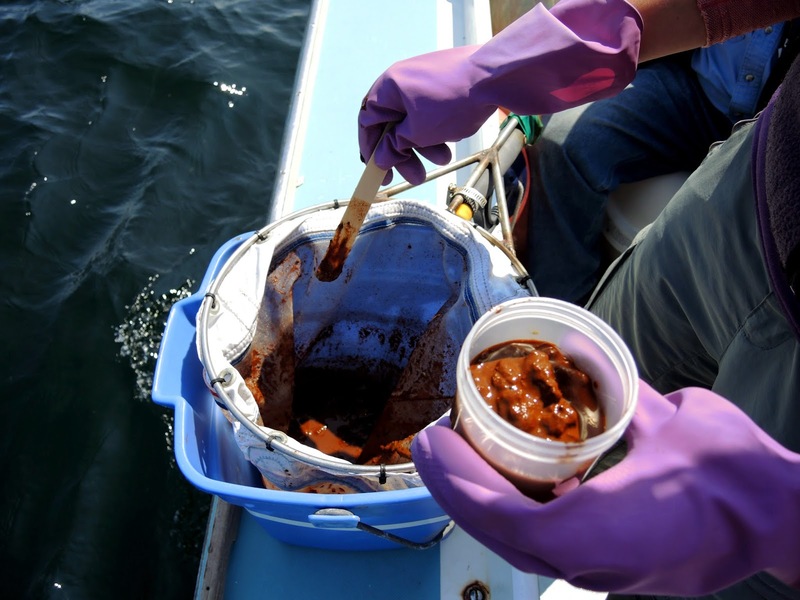 We were, however, able to collect our second poop sample for the season. We were able to smell it before finding it, but got to scoop it up before it sank. Our attempts to survey far east on Monday with "light winds" were foiled by strong winds- after two hours on survey, we decided to turn around and head back home. 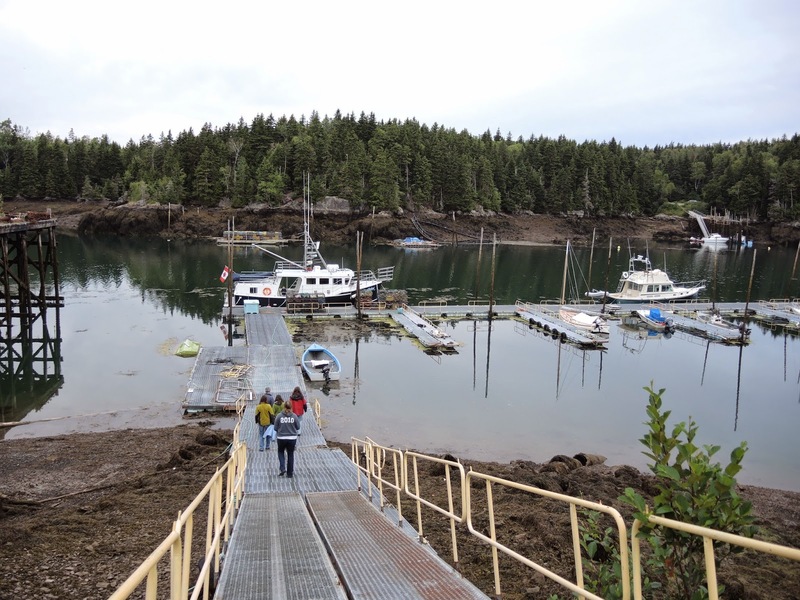 Arriving back in Lubec, we had a meeting about our upcoming offshore voyage to Roseway Basin. On Friday, a team of six will head out for a two week long survey, so there is much to do before our departure! On Friday, we left the dock around 6:45 AM, eager to see what our second survey would hold. Not too far in to our tracklines, the dark clouds that seemed so far away decided to let a few raindrops loose on us. The worst of the weather ended up on land, where folks experienced a severe storm. Lightning even struck not too far from our field station in Lubec! 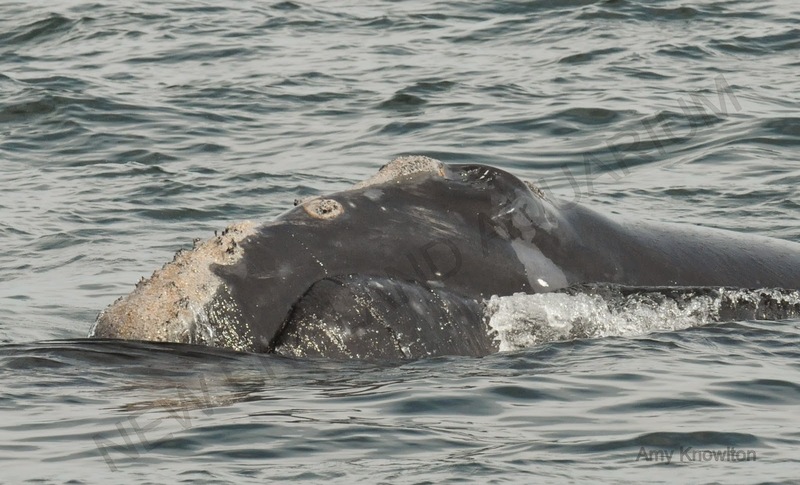 Happily, the success of Thursday's survey was not an anomaly- we started seeing right whales just before 9 AM. Our sightings were of many familiar faces that we didn't see the day before, like Junction (Catalog #3745), Phantom (#3803), and Quatro (#1968). We also saw a team favorite, Aphrodite (#1701)- actually, she is so well-loved that she's the star on the back of our Right Whale Research Program T-Shirts! Aphrodite was hanging out at the surface while we were observing her, and then all of a sudden she kind of scrunched up, rolled over and dove while upside down. It was a fun thing to watch- we're always amazed at how flexible and graceful these large whales are. As it got later in the day, the winds picked up and we decided to head in to avoid getting caught in the worsening weather. We were thrilled with the day we had- about 30 individuals photographed!! Needless to say, we're all in high spirits here and looking forward to the next day at sea. 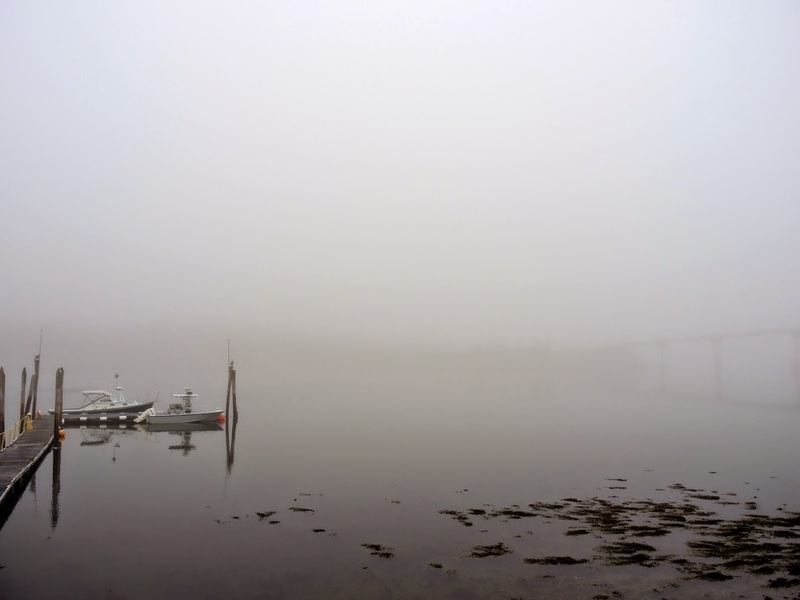 We were unable to survey yesterday because of rain and fog. But, we are giving it a shot today despite a somewhat foggy forecast. Here we go! It seems that everyone is migrating as they should. The research station is buzzing with activity- eight of us have been cleaning the office and house, organizing disentanglement gear, unpacking and testing research equipment, setting up computers and networks, and making sure the boat is fueled and ready to go. 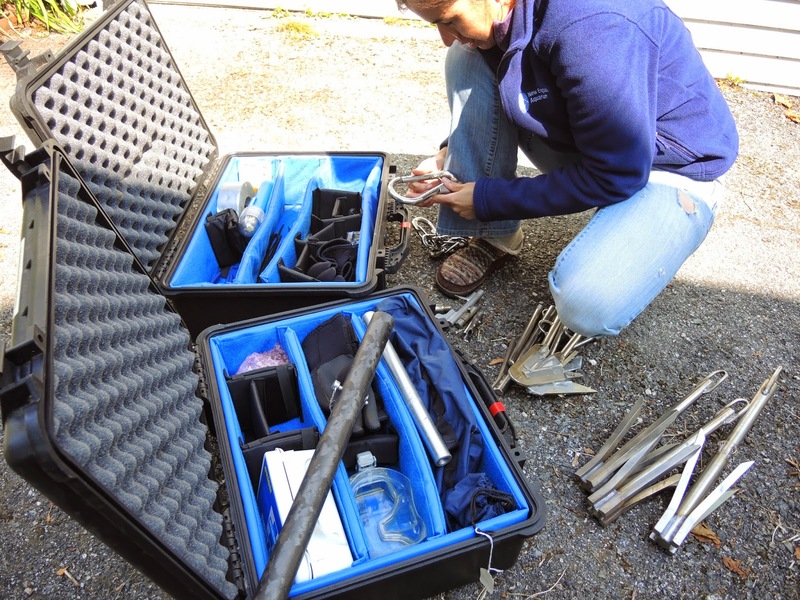 Monica takes inventory of our whale disentanglement kit, which accompanies us on every survey in case we encounter an entangled whale. 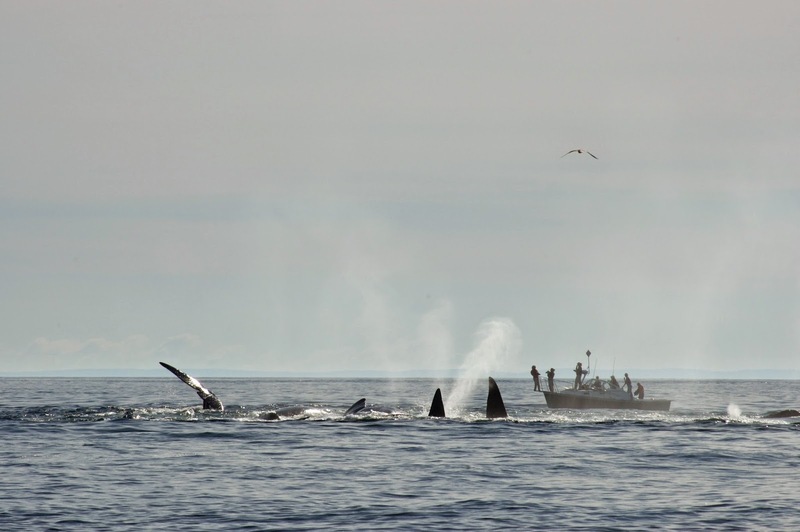 Amid all this activity we got an email from our colleague Laurie Murison at the Grand Manan Whale and Seabird Research Station that right whales are in the Bay of Fundy, and in numbers like the old days! 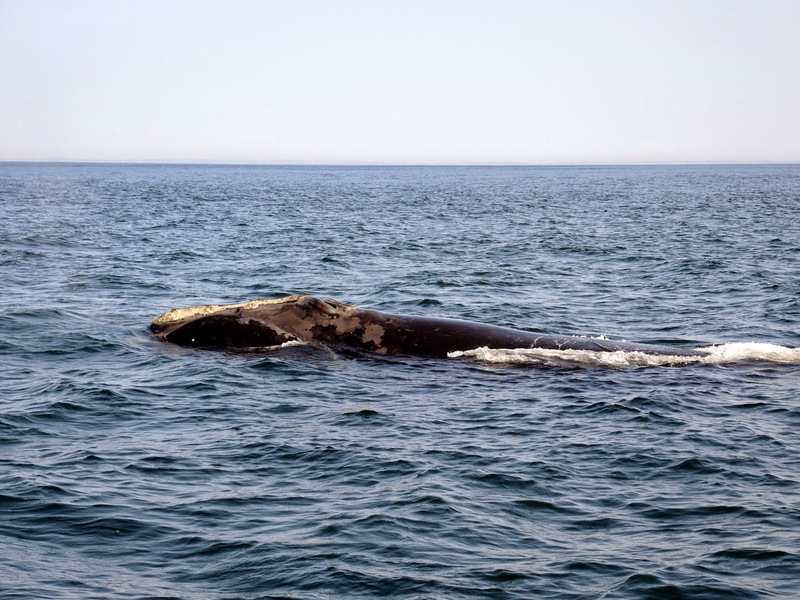 We have had a few years of scarce right whale sightings in the Bay and it is exciting to hear this news. Optimistic that our first day on the water could look like this- just like the old days. So as our first full day here as a team comes to a close, the equipment is all stacked by the door, food is purchased, the boat fueled, and the researchers eager. The weather is calling for light winds, but patches of fog and rain- the question is how big are those patches?? Keep your fingers crossed for clear weather on Wednesday. Our 35th field season in the Bay of Fundy will get underway next week and extend until the end of September. As you can imagine, it is a busy time as we are getting field supplies all pulled together- cameras, computers, satellite phones, data forms, and various other items. We've also spent the past couple of months securing research permits, sorting out our field team personnel and coordinating with other field teams who will be joining us. The Nereid crew, working mom #3513 and her calf as they swam unusually close to shore. Photo: Moira Brown, Canadian Whale Institute. 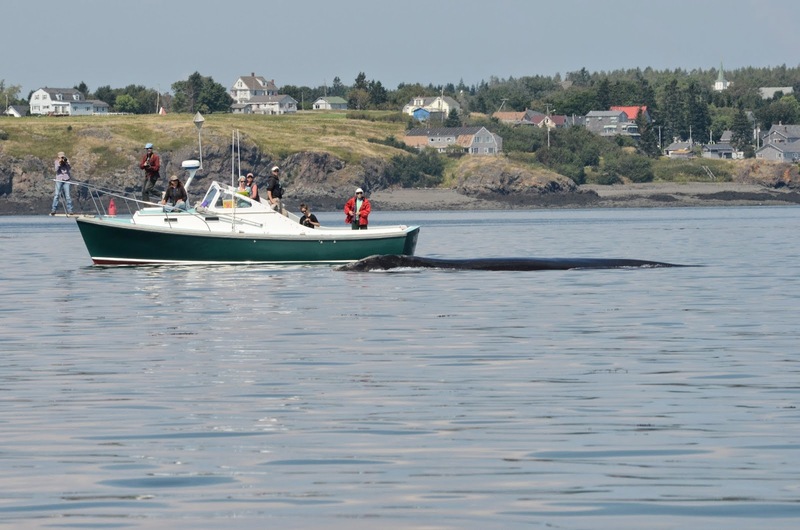 In addition to our Bay of Fundy surveys conducted on our 29 foot vessel Nereid, the Aquarium is collaborating with Canadian Whale Institute and will be conducting two offshore surveys on Roseway Basin, south of Nova Scotia. 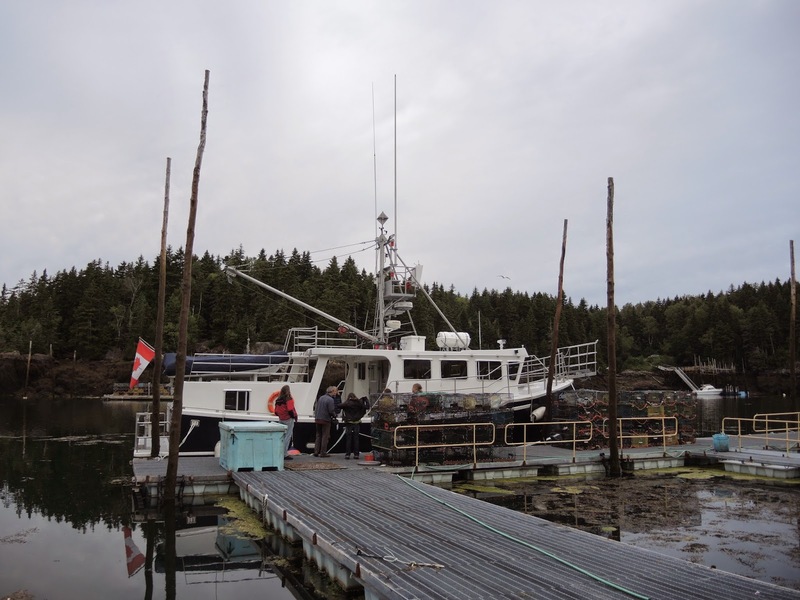 Each of these surveys will be two weeks long, and conducted on the 46 foot R/V Shelagh with a team of six persons who will live aboard the boat. 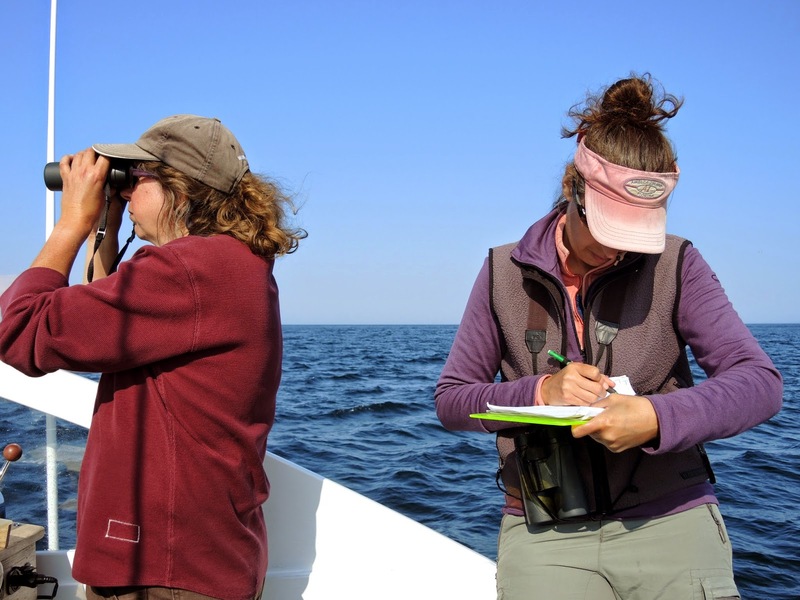 Observing right whales aboard the Shelagh during our first offshore trip last season. Joining us in the Bay this season will be another Aquarium team who will be collecting right whale respiration samples from the R/V Callisto, as well as a team from NOAA and Syracuse University who will be collecting acoustic recordings from mother/calf pairs off the R/V Selkie. Now we are keeping our fingers crossed that the right whales show up this year! There have already been a few sightings reported by the local whale watch boats, so hopefully this bodes well for a stronger right whale presence than last season! Stay tuned for the latest updates via our Facebook Group Page, and our Twitter @rightwhalescoop.